Packet pickup location GALLATIN COUNTY FAIR GROUNDS (901 N Black Ave, Bozeman, MT 59715). Bozeman Running Company will be onsite with all your RttP race day needs. 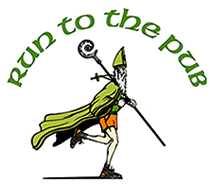 We will be holding packet pickup the day before the race, Friday, March 15 from 9am - 7pm. We will be also be holding a race day packet pickup for those runners driving to Bozeman the morning of the race from 8am - 9am, please note that race day packet pickup is only meant for those runners traveling from out of town. Race day packet pickup will also be held at the fairgrounds. CAN I HAVE MY MONEY REFUNDED (FOR ANY REASON)? No. But you can defer to the following year for $10.00 by logging into your account on www.runsignup.com, but you must do so by March 1st. CAN I SWITCH FROM THE HALF MARATHON TO THE 10K? Yes, you will need to look up your info on https://runsignup.com/Race/MT/Bozeman/rttp. Once there clink on FIND A PARTICIPANT, type your name, click MORE DETAILS, then click TRANSFER EVENT, from there you can make the change. IF SHIRTS ARE SOLD OUT OF MY SIZE WILL YOU GET MORE? No, when we sell out of shirts we are unable to get more. There are port-a-potties at each start and at the finish. Every year we add more port-a-potties, but we suggest you take care of your business early; there are always lines 5 minutes before the start! The course is coned and marked very well, but it is open to traffic. There will be volunteers and police officers at some intersections. Please run or walk on the right side of the road unless otherwise directed. Because the course is open to traffic, we discourage music devices. Baby joggers are allowed, but we ask that you start toward the back. There is NO parking at either the 10K or Half Marathon start. The bus pickup is on Babcock (see more on the Race Day page). 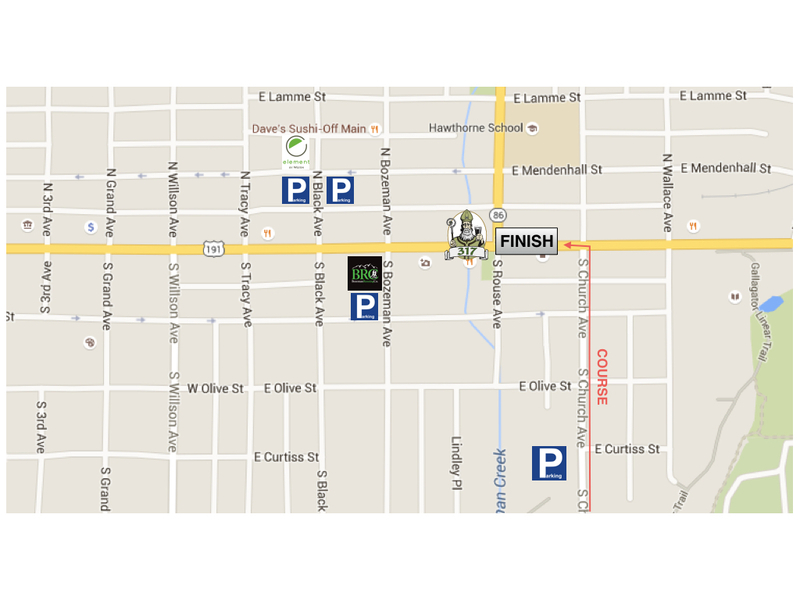 There is parking at the Parking Garage, 3 blocks from the finish line . Well it is Bozeman, MT, we would suggest being prepared for rain, snow, or shine. The race WILL take place no matter what what weather we have. There will be NO changing of shirt sizes at packet pick up. We base our ordering off of what you order, hope you understand. CAN I HAVE A FRIEND PICK UP MY RACE PACKET? I can't remember if I registered, is there a way to search for my registration? Yes, you can do so HERE. WHAT AWARDS AND PRIZES ARE THERE AND WHAT TIME ARE THEY GIVEN? Each runner will be receiving a unique finishing medal after crossing the finish line. We will also be giving awards to overall finishers, male and female in both the 10k and ½ marathon. Age group awards will be given to top three winners in there age bracket (every 10 years). We also have cash prizes for top 3 dressed runners. Awards will start at 2:00pm, following awards around 2:30pm we will be drawing numbers (your bib number) for prizes, many small prizes, 4 different Dublin Ireland marathon prizes. WHEN DO THE BUSES LEAVE? Half marathon buses will leave at 9:00am. 10k buses will leave at 9:45am. The course is open to traffic. We strongly discourage compromising your ability to hear vehicles coming. WILL THERE BE A WAY FOR MY CLOTHING TO GET TRANSPORTED FROM START TO FINISH? Yes, a uhaul will transport any items that you bring out to the start back to the finish where you can find it in the “clothing pick up” area. We are not responsible for any lost clothing or items. WHERE CAN I PARK AND LEAVE MY CAR DURING THE RACE? There is a parking garage on the corner of N. Black and E. Mendenhall, that’s 3 blocks from the finish. Click HERE for map. WE ARE VISITING BOZEMAN FOR THE RACE, DO YOU RECOMMEND ANY SPECIFIC HOTELS? No. For the safety of all runners and dogs, we do NOT allow dogs in the Run to the Pub.